I suppose I should say Stamp-SET-of-the-Month Club, but that’s a little clunky, so I won’t. This club is an online club and is a great way to build your stamp collection. You will receive one stamp set (clear) and 3 completed cards and/or projects each month, designed by me. 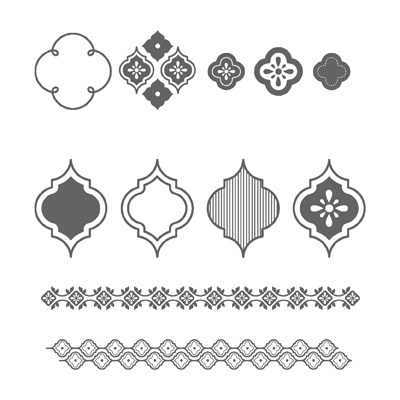 Along with your stamps and completed projects, you will also receive instructions on how to duplicate the projects and a list of supplies (including measurements) used in each project. The cost is $30 per month, which includes shipping. You may opt in or out each month. However, if you participate in the club for 3 consecutive months, your 4th month is only $25. Each month, I will select one clear stamp set from a current Stampin’ Up! catalog or promotion priced between $14.95 and $18.95 (you will need a clear block to mount your stamps). If you don’t want the stamp set I select in any given month (or already own it), you can substitute a different set within the specified price range by letting me know in your email. The club is open to anyone in the U.S., and you can join at any time. The stamp set I have chosen for August is Mosaic Madness, which is easily one of my top 3 favorite sets in the annual catalog. It’s so versatile, you can really use it on any kind of card. There are even a matching embossing folder and matching punch (not included in the club). Below are the projects you will receive with your stamps. To sign up for the August club, email me no later than August 5th with your name, address, and phone number, and I will email you back regarding payment and timing details. Or you can comment here using a valid email address, and I will email you back. 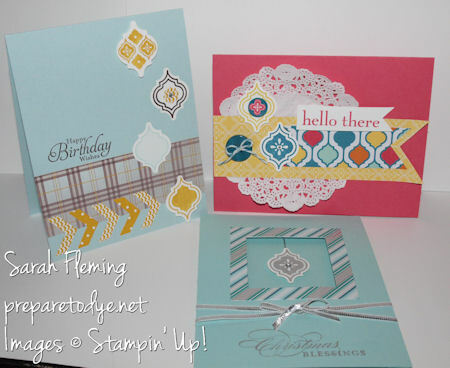 I hope you’ll join me in a little virtual stamping!